Most of the western coasts of Jutland are covered with sand dunes blown op from the shore by the dominating and often strong western winds coming in from the North Sea. The mobile dunes near the coast have a sparse vegetation and contains chalk from mussels and snails, and they appear white in colour. Further away from the coast they become fixed by the spreading vegetation. By time the chalk leaches and the sand turns grey. These leached fixed dunes gradually develop to coastal heath. Not only the sand is grey in the leached fixed dunes. In places the vegetationen is also greyish. 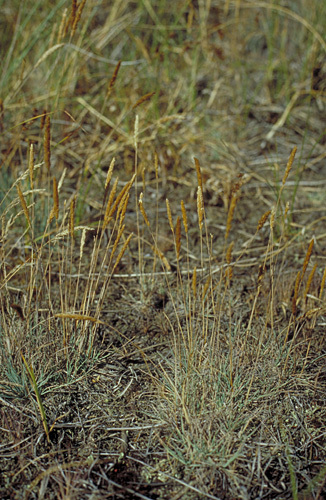 It is different species of lichens and Grey Hair-grass (Corynephorus canescens), which gives the colour. 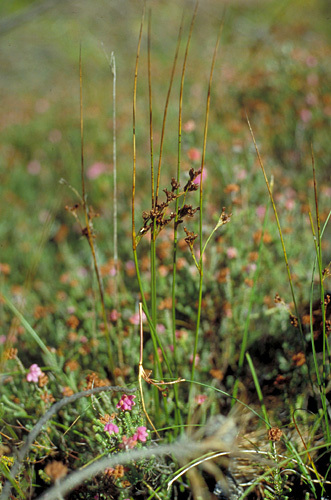 Koeleria glauca (photo) is in Denmark almost entirely confined to sand dunes along the west and north coast of Jutland. On Hulsig Hede in Vendsyssel this species is common in the zone between the fixed white dunes and the leached fixed dunes. As the leached fixed dunes are poor in chalk and other nutrients, many species of heath plants can be found here. Common are Heather (Calluna vulgaris), Crowberry (Empetrum nigrum), Creeping Willow (Salix repens var. argentea), Hawkweed (Hieracium umbellatum), Heath Dog-violet (Viola canina), Sand Sedge (Carex arenaria) and Sheep's-bit (Jasione montana). The pictures above shows Baltic Rush (Juncus balticus) and the yellow Bog Asphodel (Narthecium ossifragum) both surrounded by the purple flowering Cross-leaved Heath. Baltic Rush is quite common along the coasts of North and Western Jutland, but only known from a few places in other parts of Denmark. 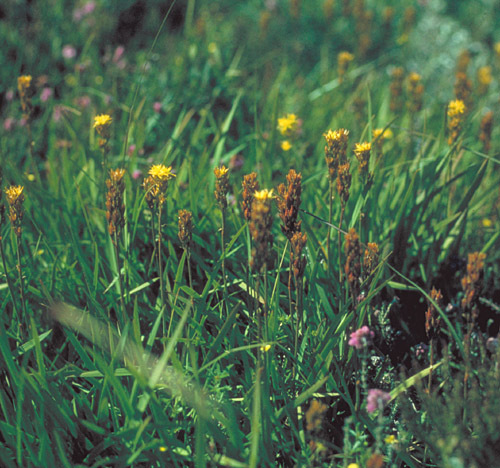 Bog Asphodel is an atlantic species and is in Denmark confined to Jutland, where it is quite common in the nortern and western parts. 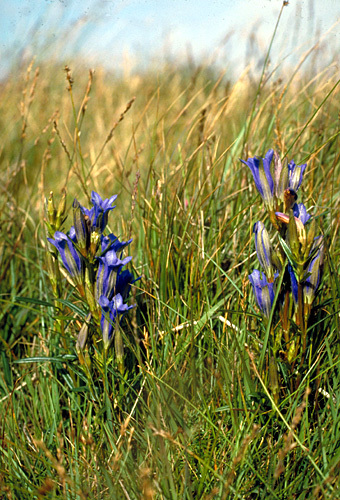 n oligotrophic fens on the coastal heaths it is possible in late summer to see the beautifull Marsh Gentian (Gentiana pneumonanthe). It is not rare in North and Western Jutland while it is declining in other parts of Denmark and near extinction on the danish isles.